At CheapTitles we sell Certificates of Title. Pay Securely via Credit Card online and we’ll email the title to you within an hour. 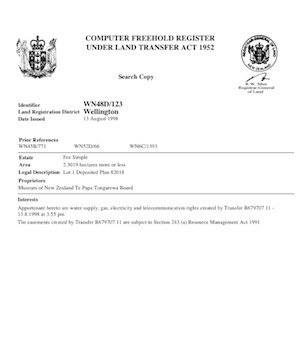 A Certificate of Title is the legal document of ownership for properties in New Zealand. A Certificate of Title document sets out the registered proprietors of the property and it also sets out the rights and restrictions that apply to the land. Why do you need a Certificate of Title? Consent Applications including Resource Consent, Building Consent and Subdivision Consent Applications. Identifying the Registered Proprietors of the property, the rights and restrictions that apply to the land and the boundaries of the property. Cheap Titles sells a full range of legal property documents such as an Interest on A Certificate of Title, Survey Plans and Historic Titles. All of these documents can be ordered online, paid for securely by credit card and delivered within an hour, we promise. "We love Cheap Titles - their easy to use website ordering process, great accurate service, and swift turnaround time. Fast, Friendly and Cheap - just awesome"